Back in 1915, the British needed the help of the Arabs in defeating the Ottoman Empire in World War I. 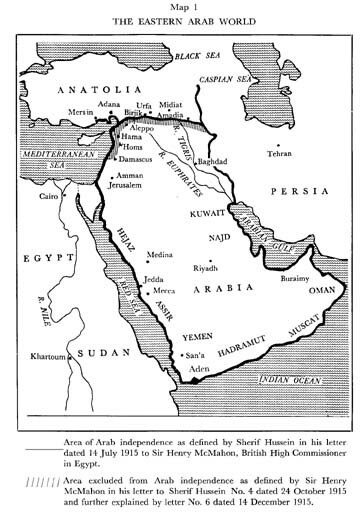 In a set of letters called the 'McMahon–Hussein Correspondence,' they promised the Arabs that if they rebelled against The Ottoman Empire (which had sided with Germany in the war), that they would get their own independent state (as depicted in the first map above). However, at the very same time the British made this promise, there was clandestine agreement in the works with France and Russia to carve up the Ottoman Empire amongst themselves. This was known as the 'Sykes-Picot Agreement.' Suffice it to say, the territory promised to the Arabs was not a part of their bargain. Then to make matters even more confusing, there was a third - and completely separate agreement with the Zionist community called the 'Balfour Declaration', promising the Jews their own ethno-state within the borders of Palestine. So with these three contradictory agreements all made at the same time, it was clear that somebody was going to get deceived. In the end, the British promises to the Arabs were a fraud. The Arabs fought and died for the British, thinking that they would gain their independence as a reward for their sacrifice. Yet what ended up happening instead, is that the British and French marched into their territory and claimed the remains of empire for themselves. 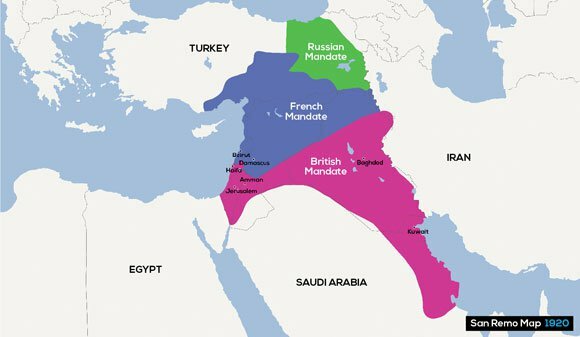 The Sykes-Picot agreement is without a doubt a watershed event in the creation of the modern Middle East. As you can see from the map of above, the creation of states like Iraq, Syria, Lebanon and Jordan were a product of Sykes-Picot. Many of the people living within these borders feel that the division was arbitrary, and indeed this has been a catalyst for bloody ethnic conflicts that continue up until today. The Sykes-Picot is also responsible for the establishment of hostilities between the Western and Arab world. While almost every school child in the Arab world knows about the betrayal of the Sykes-Picot agreement, many in the West are still ignorant about this inconvenient truth. Imagine if the French had promised America that they'd help us fight the British in the Revolutionary War, only to march into America themselves and take over in the aftermath of war. So there is still a lot of bitterness in the Arab world about this betrayal, and this betrayal set the ground work for chaos and catastrophe in the years to come. Below we include some more in depth information about these three different agreements. 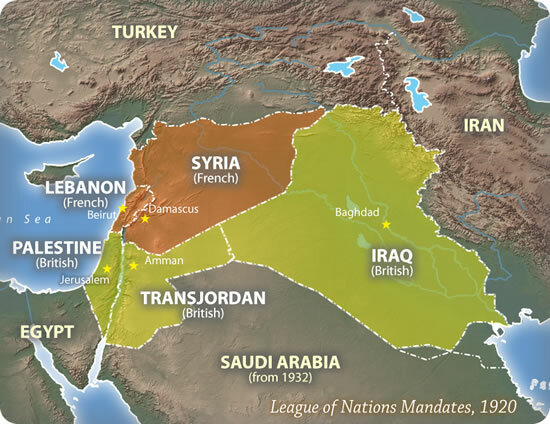 The Sykes-Picot Agreement, also known as the 'Asia Minor Agreement,' was made between the governments of Great Britain, France, and Russia, defining their proposed spheres of influence in taking control of the Middle East in the aftermath of World War I. The negotiation of the agreement occurred between November 1915 and March 1916, and was concluded on May 16th, 1916. The agreement divided the Arab provinces of the Ottoman Empire outside of the Arabian Peninsula. These were carved into areas of future colonial control. The terms were negotiated by the French diplomat François Georges-Picot and Briton Sir Mark Sykes. The Russian Tsarist government was also a minor party to the Sykes–Picot agreement. Things got pretty interesting however, when following the Russian Revolution of October 1917, the Bolsheviks exposed the agreement to the public. "The British were embarrassed, the Arabs dismayed and the Turks delighted ." The Zionists were also upset with the Sykes-Picot agreement becoming public only three weeks after the Balfour Declaration, which pretty much exposed the Balfour Declaration as a fraud. Britain was allocated control of areas roughly comprising the coastal strip between the sea and River Jordan, Jordan, southern Iraq, and a small area including the ports of Haifa and Acre, to allow access to the Mediterranean. France was allocated control of south-eastern Turkey, northern Iraq, Syria and Lebanon. Russia was to get Istanbul, the Turkish Straits and the Ottoman Armenian vilayets. The McMahon–Hussein Correspondence, or the Hussein–McMahon Correspondence, was an exchange of letters (July 14th, 1915 - January, 30th 1916) during World War I, between the Sharif of Mecca, Husayn bin Ali, and Sir Henry McMahon, British High Commissioner in Egypt, concerning the political status of lands under the Ottoman Empire. Now the Arab side was already planning a large revolt against the Ottoman Empire; however, the British further encouraged the Arabs to revolt under their direction and command, with promises of independence and their own territory. Hussein specified the areas he wished to include in the “Sharifian Arab Government” after Arab independence. Hussein’s proposed land included the Arabian Peninsula other than Aden, Palestine, Iraq, Syria and Lebanon. In his response to Hussein’s letter, McMohan agreed to post-war Arab independence on behalf of the British Government, limited only by the constraints and reservations of non-Arab territories or related to what Britain was not at liberty “to act without detriment to the interests of her ally, France”. “The districts of Mersin and Alexandretta, and portions of Syria lying to the west of the districts of Damascus, Homs, Hama, and Aleppo” were the territories not assessed as Arab by the British. As the exact meaning couldn’t be derived from this, similar to the later Balfour Declaration, Arab spokesmen has asserted since the time of the correspondence that Palestine was included in the proposed Arab Peninsula. Sharif Hussein saw World War I as an opportunity to liberate Arab lands from the Turks. The Arabs felt that the Turks had abandoned their pluralistic and pan-Islamic policies to pursue a secular Turkish nationalism. Thus the Great Arab Revolt was launched on June 5, 1915. The Arabs trusted the word of British officials that they would get their own unified, independent state. In 1918 Damascus was released from Ottoman rule at the end of the war; Arab forces had taken control of most of the Arabian Peninsula, Southern Syria and all of the modern Jordan. Yet in the aftermath of the war, Britain walked out on their promise of a unified, independent Arab state. The Balfour Declaration was a short letter by Arthur Balfour to arguably one of the most influential Jewish families - the Rothchild's. It was assumed that this letter gave the British government's support to the creation of a Jewish homeland. The British indeed were very busy making promises towards the end of World War I. While they promised the Arabs their own independent state, they also made a similar but conflicting promise to the Zionist community. The Zionists were interested in the creation of a Jewish ethno-state in Israel. James Gelvin, a Middle East history professor, claims that the British made these promises in order to appeal to Woodrow Wilson as well as the Russians. "The British did not know quite what to make of President Woodrow Wilson and his conviction (before America's entrance into the war) that the way to end hostilities was for both sides to accept "peace without victory." Two of Wilson's closest advisors, Louis Brandeis and Felix Frankfurter, were avid Zionists. How better to shore up an uncertain ally than by endorsing Zionist aims? The British adopted similar thinking when it came to the Russians, who were in the midst of their revolution. Several of the most prominent revolutionaries, including Leon Trotsky, were of Jewish descent. Why not see if they could be persuaded to keep Russia in the war by appealing to their latent Jewishness and giving them another reason to continue the fight?" ... These include not only those already mentioned but also Britain's desire to attract Jewish financial resources ." The British believed that expressing support would appeal to Jews in Germany, America and Russia - and thusly would help the war effort. Even David Llyod George, who was the Prime Minister at the time the Balfour Declaration was issued, admitted later in 1937 that the declaration was made for 'propagandist reasons'. "The idea was, and this was the interpretation put upon it at the time, that a Jewish State was not to be set up immediately by the Peace Treaty without reference to the wishes of the majority of the inhabitants. On the other hand, it was contemplated that when the time arrived for according representative institutions to Palestine, if the Jews had meanwhile responded to the opportunity afforded them by the idea of a national home and had become a definite majority of the inhabitants, then Palestine would thus become a Jewish Commonwealth ." While the Arabs promoted tolerance for the Jews at the time, they were opposed to the idea of turning Palestine into a Jewish ethno-state. The Sharif of Mecca even called on the Arabs to "welcome the Jews as brethren and co-operate with them for the common welfare." What many people in the West don't understand today, is that before World War I, relations between the Arabic and Jewish population in the Middle East were fairly tolerant. Much of the Israeli-Palestinian conflict today is a direct result of the territorial divisions made in the aftermath of World War I and World War II. However, Israel as a Jewish State was not established in the aftermath of World War I, as the Balfour declaration promised. Israel was not established until 1948. So, the Zionist community was disappointed and later David Lloyd George confirmed their disappointment when he admitted that the British promises were a fraud from the beginning, propaganda designed to gain the interest of the Jewish community in the war. The Treaty of Sevres (August 10th, 1920) was one of a series of treaties that the Central Powers in World War I were made to sign in the subsequent event of their defeat. The treaty abolished the Ottoman Empire and obliged Turkey to renounce all rights over Arab Asia and North Africa. The pact also provided for an independent Armenia and an autonomous Kurdistan, and for a Greek presence in eastern Thrace and on the Anatolian west coast, as well as Greek control over the Aegean islands commanding the Dardanelles. This marked the beginning of the partition that would end up in the ultimate annihilation of the Ottoman Empire (an empire that had lasted 600 years). This treaty triggered hostility and nationalistic feelings amongst the Turks, which ultimately led to the Turkish War of Independence, when a new treaty, the Treaty of Lausanne was accepted by Atatürk and Turkish nationalists, and which effectively brought into being the modern day republic of Turkey. Had it not been for Atatürk (which means 'Father of the Turks'), what we know as Turkey today would probably not exist. Up until the 20th century, Islam for the most part was a fairly moderate and tolerant world religion in comparison to Christianity. It wasn't perfect; non-muslims such as Christians and Jews were forced to pay a tax called the Jizya and were often treated like second class citizens in Islamic lands like The Ottoman Empire. Yet the Middle East was actually the place that Jews often fled to in order to escape the brutal persecutions and genocides that were more common place in Christian lands. One of the sad realities of the Ottoman Empire's collapse is the resulting take over of Mecca (the center of Islam) by an ultra, conservative, puritanical Muslim sect called the Wahabbis. The Al Saud dynasty and the Wahabbi religion spread to the holy cities of Mecca and Medina. Before the discovery of petroleum oil near the Persian Gulf in 1939, Western forces were ambivalent about the fate of Islam's holy lands. Yet once oil was discovered, The Al Saud dynasty gained billions of dollars in revenue. This money—spent on books, media, schools, universities, mosques, scholarships, fellowships, lucrative jobs for journalists, academics and Islamic scholars—gave Wahhabism a "preeminent position of strength" in Islam around the world. Saudi Arabia has become a chief exporter of Wahabbism, intolerance and terrorist ideology around the globe. Indeed much of the corruption of Islam and radical ideology that exists in the Middle East today is a direct result of The Ottoman Empire's fall back in 1920. So the betrayal of The Allied Powers was the turning point when relations between The West and The Arabs began to sour, for obvious reasons. Even today, terrorist groups such as 'The Islamic State of Iraq and the Levant' (ISIS or ISIL) claim one of their major goals is to reverse the effects of the Sykes-Picot agreement. While the people in this group are certainly the scum of the Earth in terms of the crimes they have committed against humanity, many of the people under their control see this issue as a legitimate grievance. And they aren't the first terrorist group to cite Sykes-Picot as the cause of their actions. The Sykes-Picot Agreement is well known in The Middle East, and taught to every Arab child in school. Yet most in The West are not taught this inconvenient truth, as it may distort the image of the Allied powers - and consequently today's leaders - as a benevolent force. : Gelvin, James (2005). The Israel-Palestine Conflict: One Hundred Years of War. New York: Cambridge. pp. 82 and 83.
: Palestine Royal Commission Report, Cmd 5479, 1937, pp23–24.